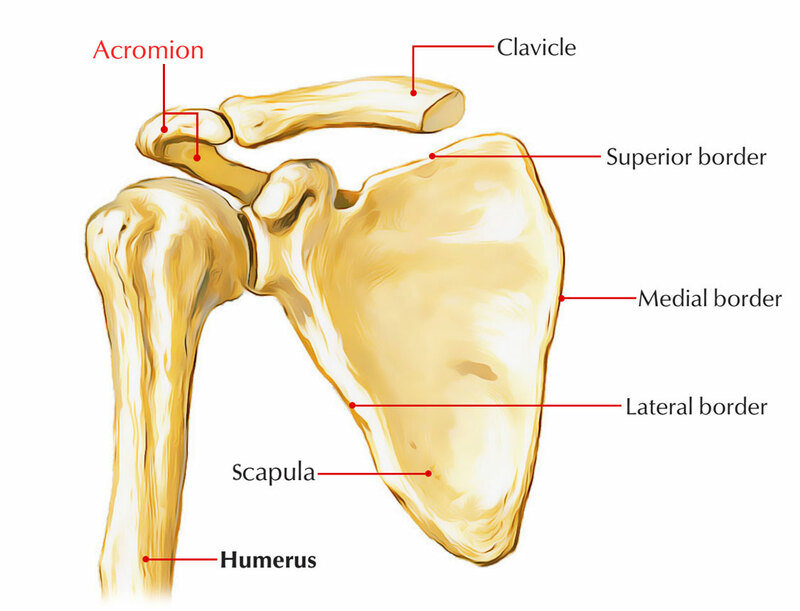 The acromion process is an anterolateral protuberance of the spine that arcs over the glenohumeral joint and articulates with the clavicle via a small oval facet on its distal end. Acromion process protrudes forward form the lateral end of spine, nearly at right angle and overhangs the glenoid cavity. It has subcutaneous superior surface. One of the most important structures of the scapula is the lateral condensation of bone that creates the acromion process. Acromion process consists of an apex, medial and lateral borders, and superior and inferior surfaces. The medial and lateral borders of acromion go along with the upper as well as lower edges of the crest of the spine of scapula, individually. Acromion process has rough and subcutaneous superior surface. Its inferior surface associated with subacromial bursa and is smooth. Attachment of acromion process to the trapezius muscle is given by the medial border of acromion. A circular surface near the apex is produced by the medial border, which connects with the lateral end of clavicle in order to create the acromioclavicular joint. Intermediate fibres of the deltoid muscle originate from the lateral border of acromion. The tip of acromion gives attachment to the coracoacromial ligament. The acromion process along with the coracoacromial ligament forms the coracoacromial arch. The acromial angle is at the junction of lateral border of acromion as well as lateral border of the crest of the spine of scapula. The area among the superior lateral humeral head along with the coracoacromial arch is referred to as the supraspinatus outlet, which is also the site of superior rotator cuff tendinitis along with bursitis. The shape of the acromion is associated with the development of rotator cuff pathology. The lateral and posterior two thirds of the deltoid muscle attach to this site. The deltoid muscle gets an important mechanical improvement while elevating the arm by the lateral extent of the acromion process relative to the medial glenoid process. Type III acromion – possesses a sharply hooked undersurface that is highly associated with subacromial disease. The acromion process is created by fusion of several growth centers. 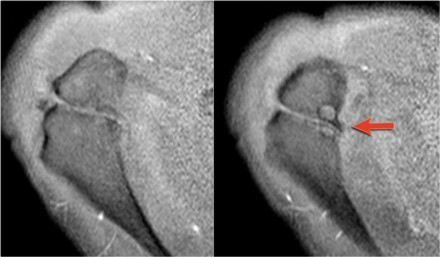 An os acromidle or unfused acromial epiphysis may occur due to incomplete fusion. While an os acromion is rare, it may cause operational malformation and contraction of the supraspinatus outlet, and also the pseudojoint it creates may turn out to be arthritic. The name along with functional significance of the os acromiale is subject to its position relative to the scapular spine. Generally, a fracture of the acromion process arises at the junction of the spine and the acromion. It is typically positioned vertically and related to little displacement. It is generally initiated by a direct impact on shoulder, but it may occasionally be the result of a superior glenohumeral joint displacement. It must not be confused for an os acromiale, which has sclerotic and well-corticated borders and is frequently bilateral.